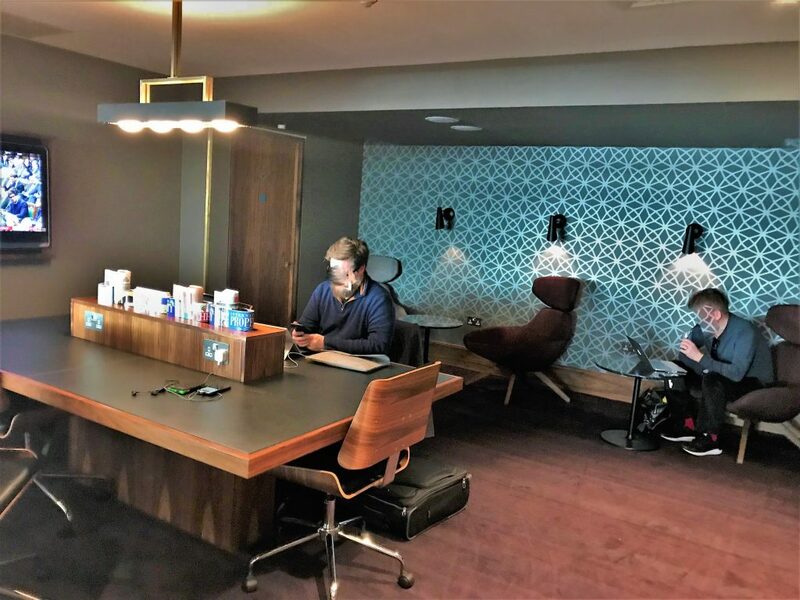 I have previously reviewed the No 1 lounge Gatwick North which I quite liked apart from the difficulties getting in on a Priority Pass. I had tried to get into the No 1 Gatwick South with my Priority Pass on numerous occasions and even when the terminal seemed dead elsewhere. I tried asking if I could come in to do the review as I wasn’t going to be very long but to no avail. Eventually, I decided I would just pay the £5 fee to guarantee my entrance. You can guarantee entrance by paying a £5 fee on this page if you have access through a lounge pass scheme. The lounge is located after security. Just follow signs for No 1 Lounges which takes you to the corridor between Dixons and JD sports. The lounge is open 4:00am to 10:00pm daily. The entrance to the lounge looked pretty smart with fresh flowers and the receptionist was friendly. 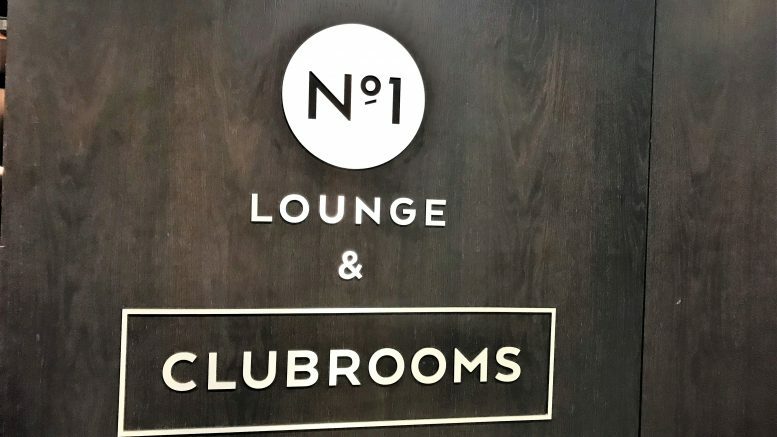 She found my booking and offered me an upgrade to the Clubrooms for £15 which are a much more upmarket proposition to the No 1 lounge with free Champagne and a more extensive menu. I will be visiting the Clubrooms at Gatwick South later this week. I politely declined and entered the No 1 lounge. It was extremely busy (unlike the BA lounges when I went later that day). There were few seats to be found particularly in the dining area. I had liked the No 1 Gatwick North lounge but this felt cramped in comparison. In the main area was a small dining area, a central bar and a raised seating area. There was a least a good view of the airfield. There was a table by the dining area that had a few snacks and some soup. Given that I visited at lunchtime I thought this was quite a poor selection. There was also food to order at the table. I eventually managed to find a table in the dining area by hovering for a while and sat down at a rather dirty table. 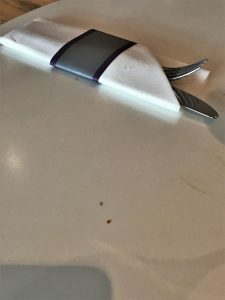 The waitress did not bother to clean it but simply plonked down fresh cutlery on the dirty table. Nice! 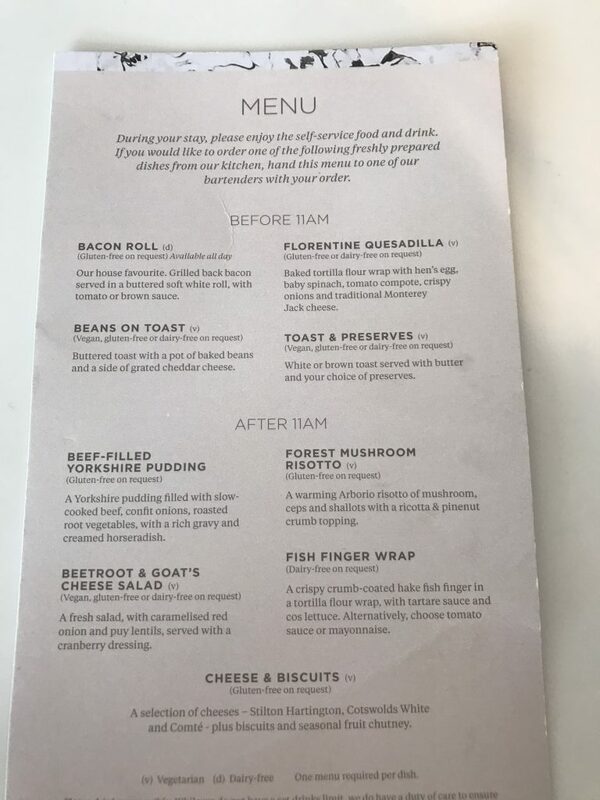 I had already got a glass of Prosecco from the bar (this has now changed – see below) so I had a look at the food menu. It seemed pretty limited considering there was no buffet either. 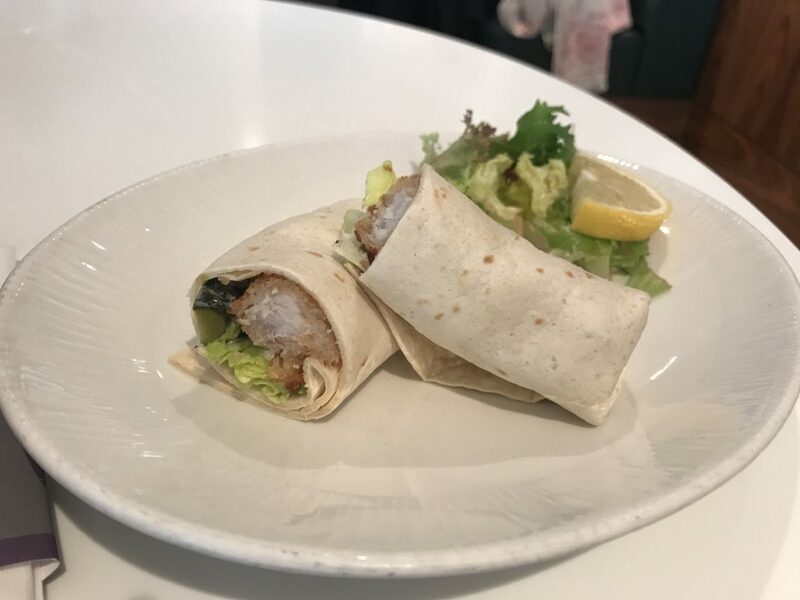 I remembered having a nice fish finger sandwich at a No1 lounge before so it thought I would give the fish finger wrap a try. When the fish wrap arrived it looked OK but tasted very disappointing. The fish inside the solitary fish finger was mushy with a soggy coating and there was virtually no tartare sauce making it very hard to choke down. I also would have much preferred a sandwich to a wrap but that may be personal taste. The only pudding in the list was cheese and biscuits although it did sound like it had some good quality cheeses. The other option was the selection of cakes and cookies by the coffee machines. These had a gluten-free option too. There was a surprisingly wide choice of drinks in the lounge. At the time they had prosecco as the sparkling wine but they now have a choice of 2 sparkling wines. The quality of the wines is not great generally with the still wines being around £6 and the sparking around £8 retail. There were lots of spirits to choose from though and the Prosecco I had was fine. If you wanted soft drinks there was a fizzy drinks dispenser to help yourself to as well as still and sparkling water from a tap. Next to these were a few carafes of fruit juice too. 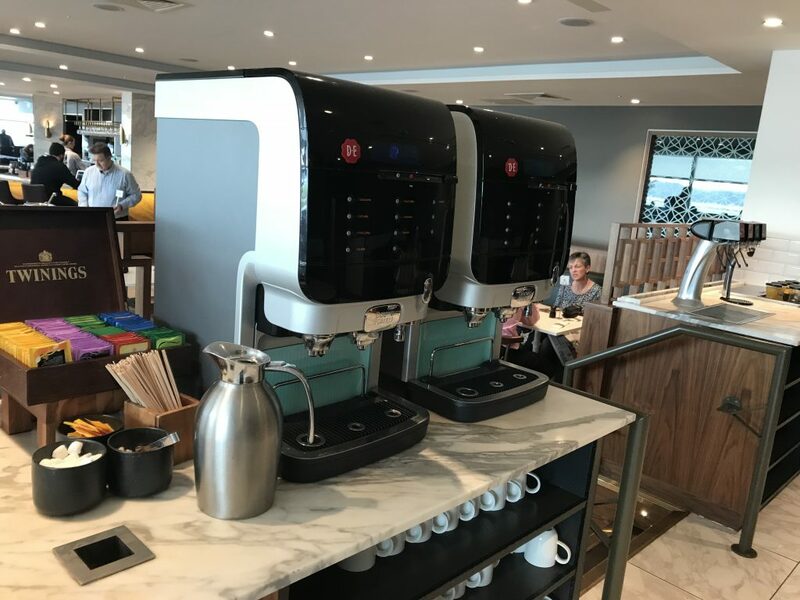 There were also two coffee machines with the usual selection of latte, cappuccino etc plus various Twinings teas available. 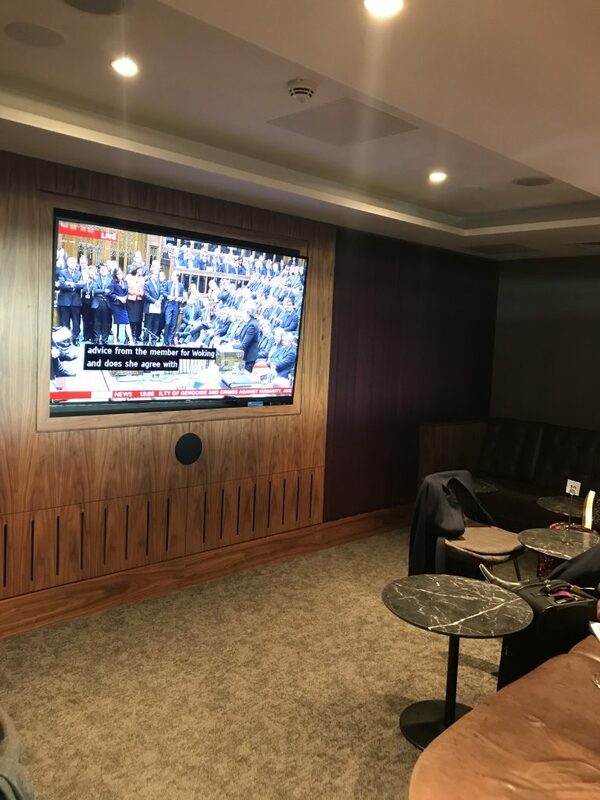 There were no showers in this lounge but I am guessing at Gatwick there is not a huge amount of connecting flights which may be why. The lounge did do better with facilities than I expected other than showers though. 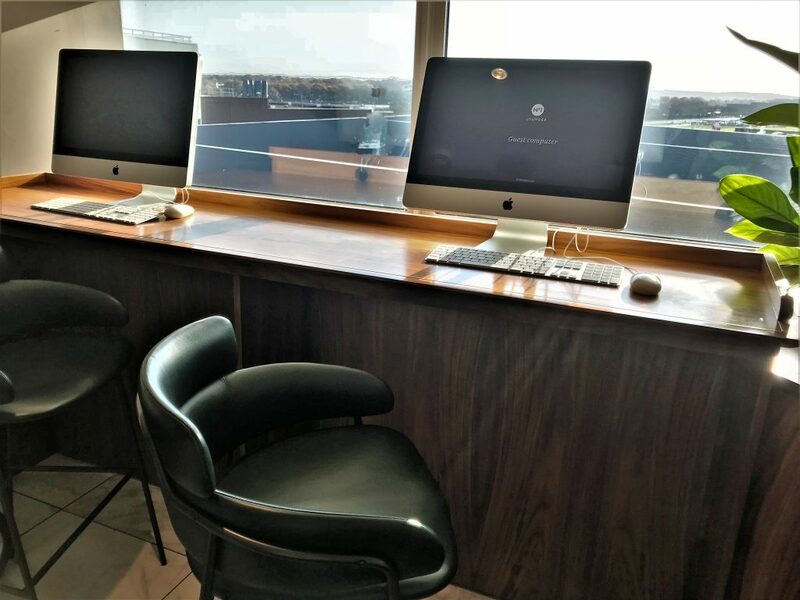 There were two Mac computers available to use with a nice view of the airfield. 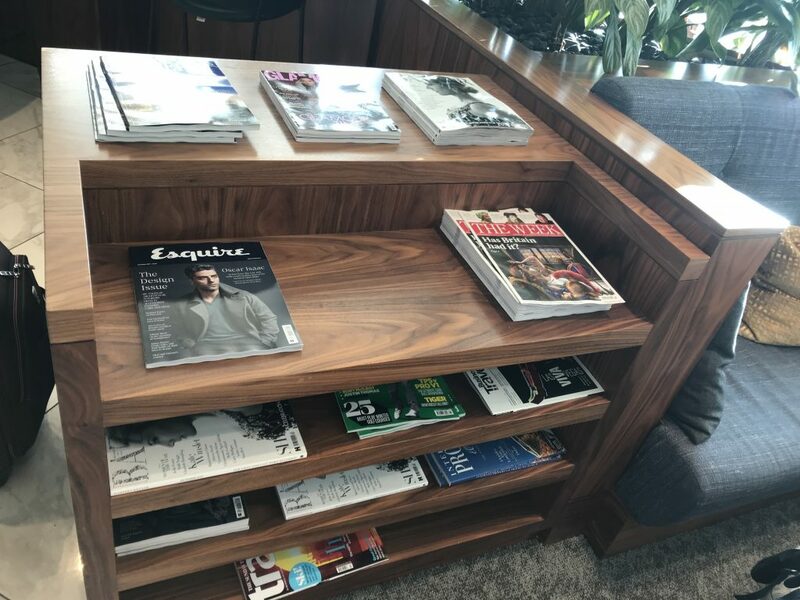 The reading material was also good quality and definitely better than some of the very bizarre publications I keep seeing in the BA lounges recently. There were several newspapers and lots of mainstream magazines to choose from. If you wanted a bit of peace and quiet there was a library quiet area which did not allow children under 12 or mobile phone calls (hurray!). This was also a good place to work with a long desk area with plenty of charging points. If you wanted to catch up on some news there was a TV viewing area that was almost empty. 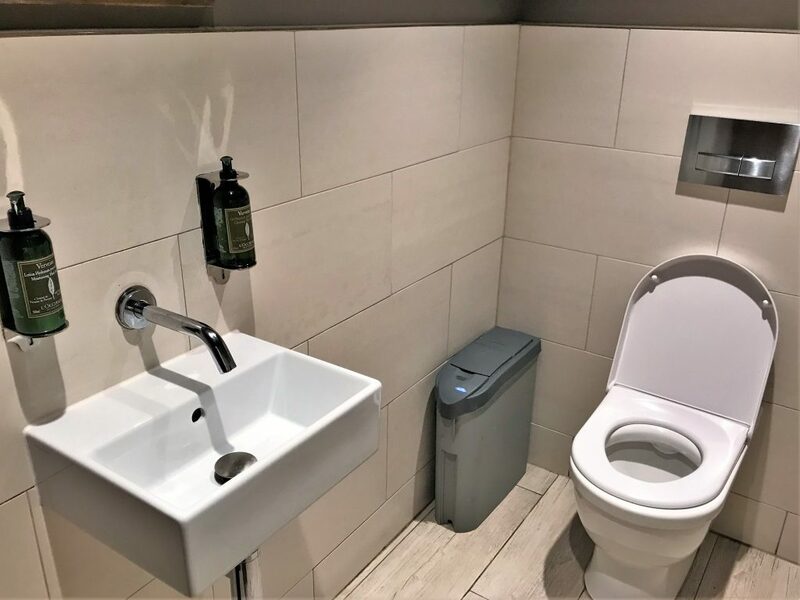 The toilets were clean and modern with some nice L’Occitane Verbena toiletries. 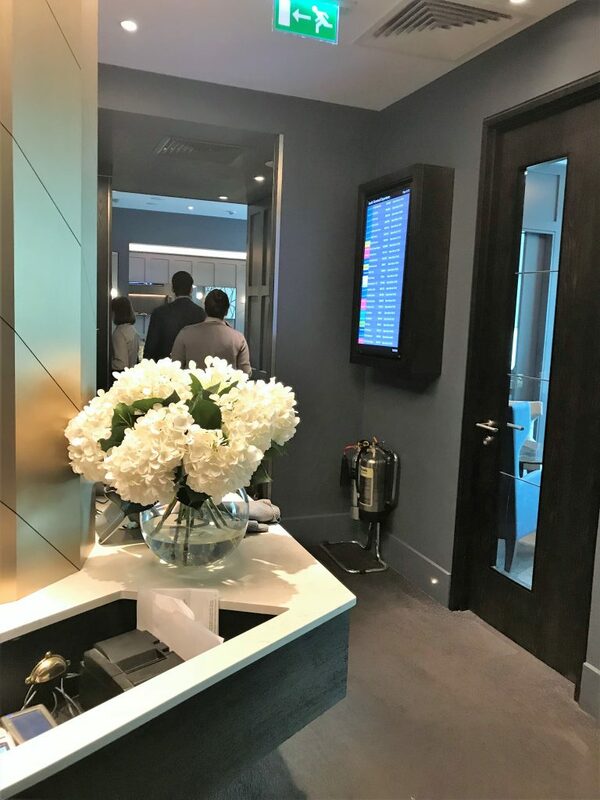 In this article, I looked at the ways to get reduced price access to lounges. 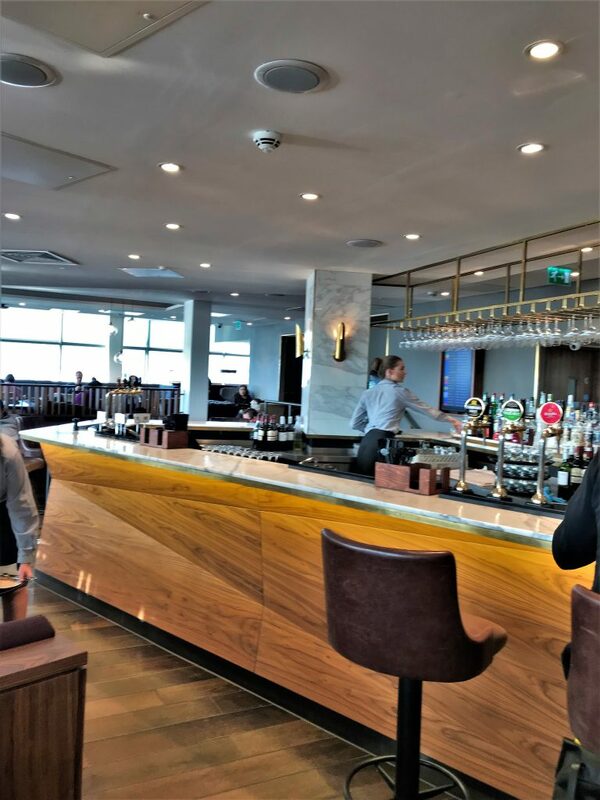 LoungeBuddy is an app for Android and IOS which is very useful and has a best price guarantee (which you may need to use as it is currently showing £40 for No 1 Lounge access!). Even if you don’t use it to buy access, it is a handy app for the frequent traveller. You can link it with your Tripit or Concur accounts and it will then add trips to the LoungeBuddy app. You can add additional information such your Elite status in airlines, credit cards and any memberships such as Priority Pass. Once you are ready to use a lounge, it will tell you which lounges you can access in your location or intended location. It is probably the quickest way to find a lounge. If you have Tripit Pro you get a one time $25 money off code for LoungeBuddy too. 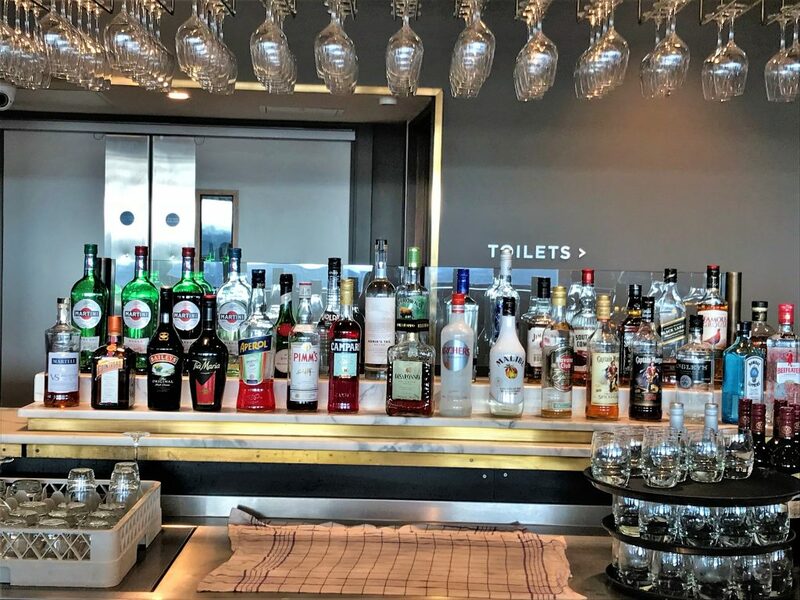 To access the No 1 lounge at Gatwick most options are currently the same as booking direct which costs £32. However, you can book through Virgin Atlantic as a Flying Club member (free to join) and book here for £25. You will also earn 350 miles per booking for No 1 lounges. If there are 2 of you visiting obviously it would be better to make 2 separate bookings if you are collecting the miles. 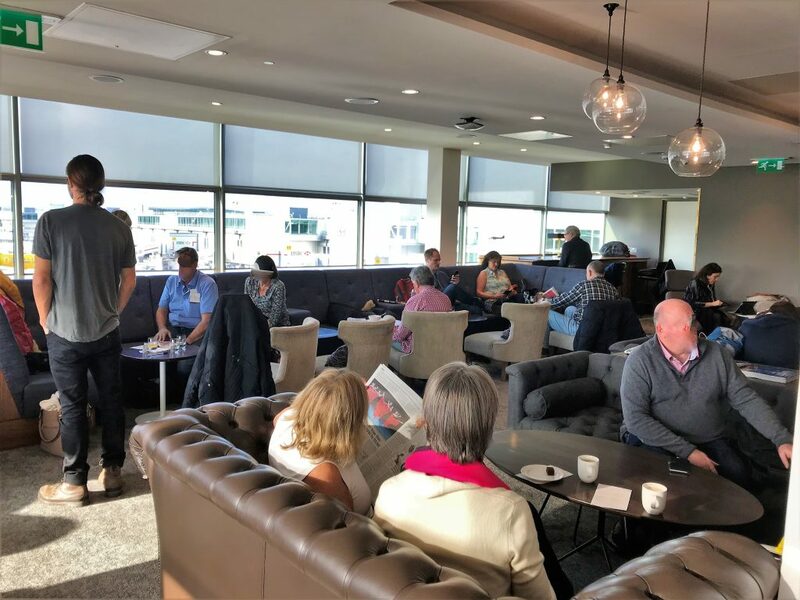 You can no longer earn Avios with No 1 lounges directly. You can earn £12 Avios per £1 spent if you book your visit via the Avios eStore using lounge pass which costs £32 – the same as booking direct. You can also book direct with No 1 Lounges via this page. I found this a pretty disappointing lounge and I am not sure it is really worth paying the £5 to get in with PP unless you are a) not worried about food and b) not worried about decent quality wine or c) planning to drink quite a few spirits. I didn’t find it very relaxing as it was busy and the food was poor in terms of selection and quality. If you can get in without having to reserve on your Priority Pass or Dragon Pass then it would be worth it since it would be free. If you didn’t have airline lounge access but had a Priority Pass I would recommend the Grain Store instead. This is an airside restaurant at Gatwick South that gives £15 off per person for Priority Pass holders. 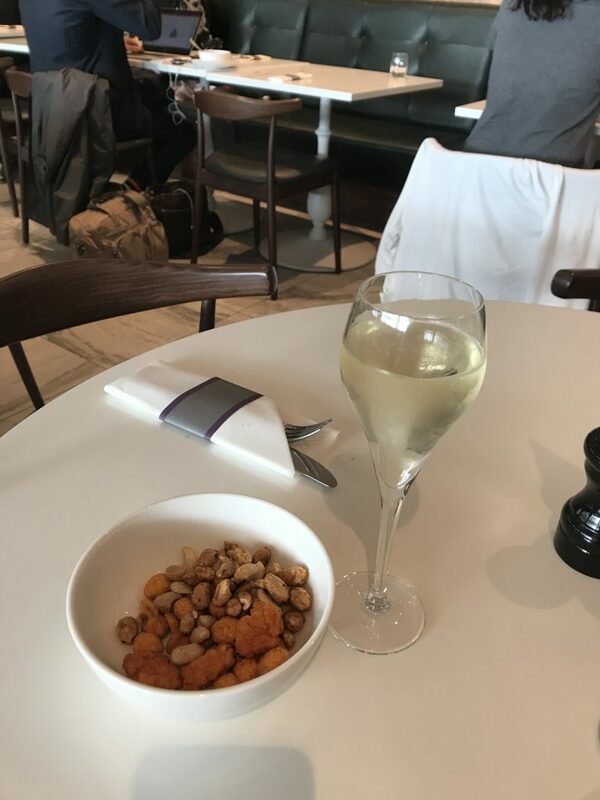 4 Comments on "No 1 lounge Gatwick South review + how to secure entry with Priority Pass & Dragon Pass"
I saw the entrance to this lounge recently when we were in Galleries south and wanted to take a look as I have 2 x Priority passes burning a hole in my pocket. TBH I’m glad we didn’t bother, highly recommend new Galleries south though and looking forward to trying F lounge at LGW South soon. Hi Adam. Yes the Gatwick BA lounges are a huge improvement. I really like the F lounge there – its better than the Heathrow ones. 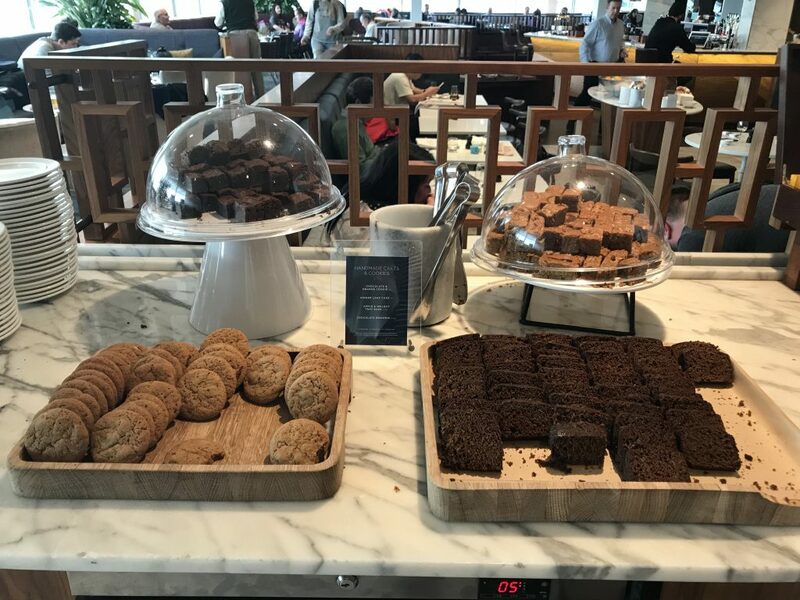 The staff are really helpful and friendly, it’s usually quiet in the afternoon and the food is better quality than Heathrow too. Well worth a visit. There’s a review of it under reviews- lounges although I will be doing an updated one shortly with some 360 photos. Thanks, great review and video. Out if interest what video making software do you use for putting your pics together? I’m looking for one that does the same as yours i can use on Android tablet. Thanks Adam. It is the windows movie maker desktop app.